Natural incenses are prepared with Natural Perfume Oils, Resins and Wood Powders. These materials are hand rolled over the thin bamboo sticks. They are used in temples, at home and work places to create a pleasant, peaceful and holy atmosphere. 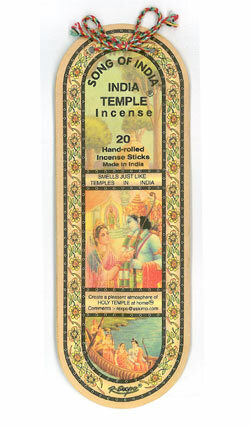 Each pack includes 20 sticks - burning time 30 minutes. Smells just like temples in India! A very fine fragrance that matches and blends into human senses of scents. You may not even realize that incense is burning. When you enter the room - It's like Heaven! Keep a package in your car, room or desk for a neutral potpourri. Burn after a month for a heavenly atmosphere around you.